Set in London and surrounding towns in 1940-1943, A Secret Courage is part of The London Chronicles. Main character Emma Hanson joined the Women’s Auxiliary Air Force and works as a Photographic Interpreter as part of the Photographic Reconnaissance Unit at the historic Danesfield House during World War II. She meets the mysterious Will Fletcher, who bears both German and British blood. Who is he, really? Secrets surround both of them and their real duties, and danger threatens everything as the war with Germany rages. A friendship begins that turns to something more. But can Emma trust Will? Has she risked everything in opening her heart to him? I really enjoyed this book. It wasn’t one that kept me up, reading far too late into the night, but it was good nonetheless. It did seem slow moving at first, and I have to admit, I was getting nervous toward the end when there didn’t seem to be nearly enough pages left to wrap up the book satisfactorily to fully explain the plot. The story picked up pace dramatically for the last bit though, and ended quite satisfactorily. I look forward to reading more of Emma and Will in this series as they are released. I have a few “hopes” of where this story will go. It was easy to get involved in the lives of the characters – and I still Will’s paintings were more than merely in the mind of the author. I want to see them! They sounded amazing. Liberty, 13 and in 8th grade, is taking a class at co-op this semester studying WWII and it’s become a constant topic of conversation in our house. She’s in the middle of writing a book report on a fiction book from that time period for her class. When I was taking too long (as in, more than 24 hours!) 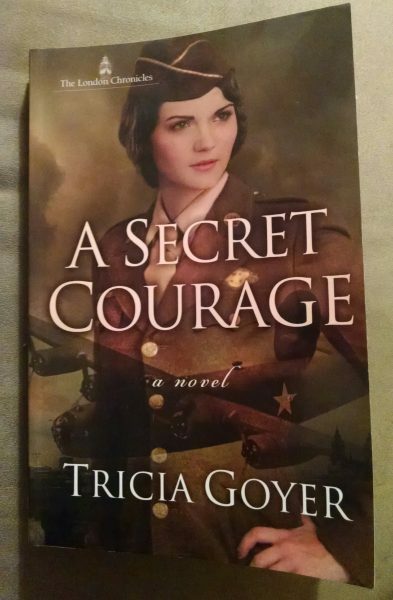 to finish A Secret Courage, she moved on to another of Trisha Goyer’s books written about WWII. Turns out, we’ve found a new author to love and follow. The receipt of A Secret Courage prompted a trip to the library to find other books by Mrs. Goyer. We found quite a few! She has dibs on reading A Secret Courage next, now that I’ve finished it. I think we’ll swap. I’m curious to see what else Trisha Goyer has written! There’s even one we picked up that is co-authored with Sherry Gore, whom I’ve followed and read from for several years. Very cool! A Secret Courage is published by Harvest House Publishers. It has 304 pages. Mrs. Goyer did a huge amount of research in writing about the second world war, and I learned a fair amount. There were a few typos in the book, but only a few. I received a copy of A Secret Courage in exchange for my honest review. I also received a few bookmarks and a lovely thank you for my willingness to review this. It was fun to “hear” from the author! I was not required to write a positive review and all opinions are my own. If you get a copy, come back here and let me know what you thought!